Helen Hawkins was born in Bristol in 1895. Daughter of John Bawtree Hawkins and his wife Georgina. Census records indicate that the family came to Essex before 1901, settling at Ballast Quay House Wivenhoe. Her father, John, was a gentleman farmer, son of a Borough Councillor who was three times Mayor of Colchester, and an Essex County Councillor and a JP. The 1901 census reveals that the family employed a governess and had 4 servants. 10 years later Helen and her family have a “secretary”, Madeline Dewhirst, living with them. “if Wivenhoe men followed the example set them by Miss Hawkins he was certain that when the Germans did come they would not be able to get far up the river”. John Hawkins had also been instrumental in setting up a branch of the British Red Cross Society in Wivenhoe in November 1910. Within 3 months of the formation of this detachment, 14 Wivenhoe women had successfully passed for their First Aid Certificate. Helen Hawkins and Madeline Dewhirst were among them. Helen appears to have had had a strong sense of duty. 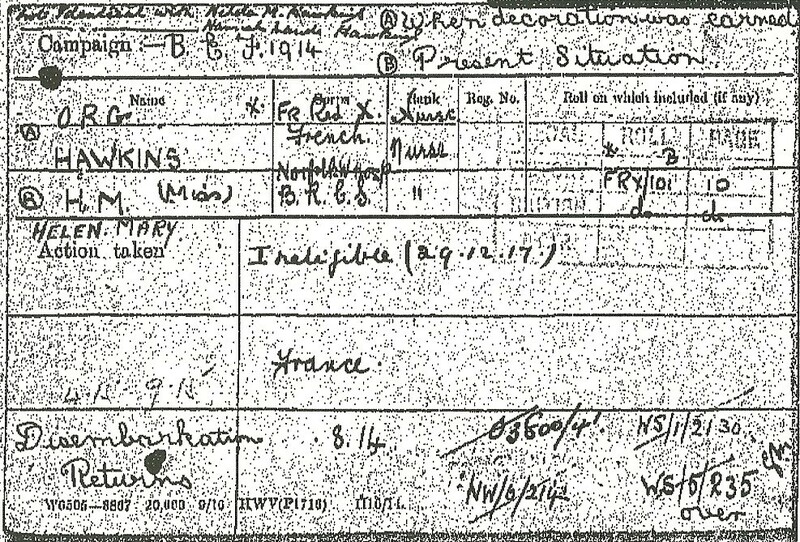 Her War Medal Record shows that she left for France within weeks of the declaration of war, August 1914. She was awarded both the Victory and British medals while serving as a nurse for the French Red Cross between April and September 1915. These medals demonstrate that she was a member of a British fighting force serving within a theatre of war. In Helen’s case this was the British Expeditionary Force in France. Helen was just 19 when she left Wivenhoe. Nothing Helen had previously experienced would have prepared her for this work. Madeline Dewhirst didn’t leave for France until January 1915 so who did Helen go with? It is unlikely that her father would have allowed her to go unchaperoned. We know Madeline also worked for the French Red Cross at the same time as Helen. They may well have been serving together at some point in the same French Auxiliary hospital south of Verdun. As far as we know Helen didn’t return to Wivenhoe, but continued to serve as a nurse at the Norfolk W Hospital until 1917 when her medal card describes her situation as “ineligible”. Once her Red Cross Record card has been transcribed we hope a little more about what happened to Helen during this period will be revealed. 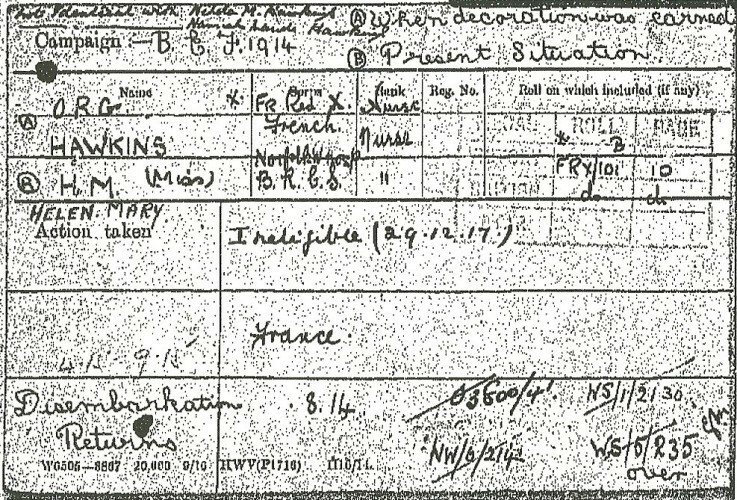 Her father, John Hawkins, died of pneumonia August 1916 while serving as Captain in the Essex Regiment in France. Following this, Ballast Quay House was sold and the remaining family left Wivenhoe. This page was added on 22/03/2015.